It's one of a family's most wrenching decisions, and as Alzheimer's increasingly is diagnosed in its earliest stages, it can be hard to tell when a loved one is poised to become a danger. Factor in that much of the country lacks public transportation, and quitting too soon restricts independence for someone who otherwise may function well for several years. Typically, specialists say, patients gradually scale back their driving, avoiding busy freeways or night trips or left-turn intersections. Alzheimer's Association adviser Sue Pinder, 58, recently gave up big-city driving even though it meant fewer visits to a daughter in Dallas. Shortly after Pinder's diagnosis in 2004, she signed a form designating her husband to decide when she'll quit driving altogether. He gave her a GPS system for her last birthday. It helped Pinder navigate unfamiliar streets when, to be near another daughter, the couple recently moved to West Monroe, La., from a nearby town. Working on ways to help similar patients, Dawson's team in Iowa developed an intricate behind-the-wheel exam: A 35-mile drive through rural, residential and urban streets in a tricked-out Ford Taurus able to record just about every action the driver takes, much like an airplane "black box" does. Lipstick-size video cameras were positioned to show oncoming traffic, too. Researchers recruited 40 people with early-stage Alzheimer's who still had their driver's licenses to take the road test, and compared how 115 older drivers without dementia handled the same trip. The results, reported in the journal Neurology, are striking. On average, the Alzheimer's drivers committed 42 safety mistakes, compared with 33 for the other drivers. Lane violations, such as swerving or hugging the center line as another car approaches, were the biggest problem for the Alzheimer's drivers. They performed 50 percent worse. Overall errors rose with increasing age whether or not the driver had Alzheimer's, an extra 2½ mistakes for every five years of age. But some Alzheimer's patients drove just as well as their healthier counterparts, stresses Dawson, a biostatistics professor. Here's the key: Researchers also checked whether any of a battery of neuropsychological tests given beforehand accurately predicted who would drive worse - and some did. Flunking simple memory tests didn't make a difference. Standard neurologic tests of multitasking abilities did, ones that assess if people's cognitive, visual and motor skills work together in a way to make quick decisions. Examples include showing patients geometric figures for a few seconds and having them draw the shape from memory, or drawing paths between a sequence of numbers and letters. Alzheimer's patients who scored average or better on those types of written tests were likewise no worse behind the wheel than other older drivers - but those who scored worse than average tended to commit about 50 percent more errors on the road, Dawson says. More research is needed but the ultimate goal is an easy doctor's-office exam to help guide when patients should give up the keys. About 600,000 elderly adults stop driving for some health reason every year, according to the National Institute on Aging. But there's little clear guidance for the roughly 2 million people estimated to be in Alzheimer's early stages, and the disease is poised to skyrocket in two decades as the population grays. States have varying laws on when aging drivers must pass a road test for a license renewal, but they seldom address specific diseases; California requires reporting of Alzheimer's diagnoses so driving can be assessed. 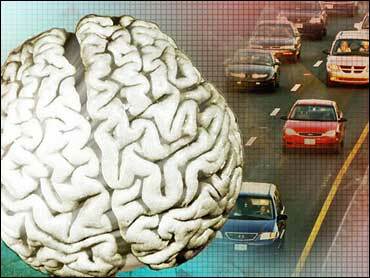 The Alzheimer's Association tells families warning signs of unsafe driving. But as Alzheimer's worsens, patients often vehemently deny that they're a hazard, says Dr. Gary Kennedy, geriatric psychiatry chief at New York's Montefiore Medical Center. "I can be the bad guy," he tells families, sometimes reporting patients to the Department of Motor Vehicles for a driving test or advising relatives to disable the car. "Giving up the car is not like going into the nursing home," Kennedy counsels patients, trying to recruit relatives or friends to schedule rides. "If as a society we recognize this as a danger, we need to help them compensate."